Bed Bugs Like Three Square Meals, Too! Have you ever been bitten by a bed bug? We hope not! Some people don't react to them at all, but most people can end up with anything from little red bumps to large welts if they are especially sensitive. Did you know...? 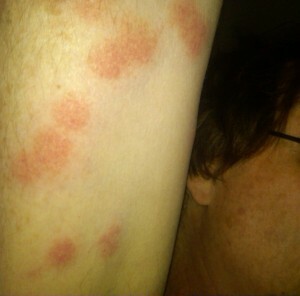 A bed bug bite takes between 7 and 10 days to appear on the skin. You could get bitten at a hotel over a weekend and not even know it until you've been home for a week! They may or may not itch and they are usually quite small. The often occur in a set of three, commonly referred to as “breakfast, lunch and dinner.” Ew. Similar to poison ivy and poison oak, only allergic people will react to bed bug bites, but those reactions can range from small itchy spots to anaphylactic shock (very rare). The skin of the hands, feet and face are more sensitive to bed bug bites and react more than other areas of the body. Bed bug bites are also often misdiagnosed by doctors. Bed bug bites can easily be mistaken for mosquito bites, although they are typically longer. The swelling from a bed bug bite can be up to 20 centimeters across if you have a strong reaction. The bite eventually progresses to a blister not unlike what is seen in chicken pox. Double ew. Since bed bugs do not feed every day, your rash or series of bites might only occur sporadically. Bed bugs are most active at night, but they can adjust to a different sleep schedule so you are not safe if you sleep during the day. Unfortunately, there are also psychological effects from a bed bug infestation. Loss of sleep, anxiety and high levels of stress accompany these pests everywhere they go. Luckily, bed bugs do not carry disease and the bites will go away on their own. You can treat the itching topically as you would any other bug bite. The most important thing to do is to eradicate the infestation as soon as it is discovered! High heat has been proven to be the only eradication method effective in just one treatment. It kills bed bugs at every stage of development—eggs through adults—and does not contaminate a structure with powerful chemical insecticides, which require more than one treatment, bagging of food and moving out of the structure for an extended period. Alliance Environmental Group is proud to offer ThermaPureHeat, which raises the temperature of an area, a room or an entire structure to over 150° to kill all insect pests in one treatment. If you think you have bed bugs, please contact us! Our services are available throughout California! Don't let bed bugs make you lose sleep! Get rid of them with heat!